I downloaded this audiobook after a friend of mine recommended it, and everything he said about it is true. 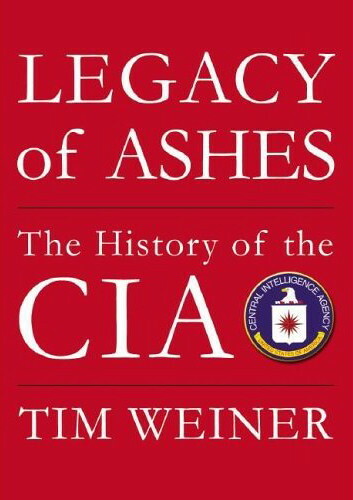 It’s a highly detailed, exhaustively researched, scathing history of the Central Intelligence Agency from its birth after the Second World War through the book’s publication in 2007. Weiner, a New York Times correspondent, bases his history on thousands of declassified documents, known events, and personal interviews. Everything within this book is apparently true and can be corroborated with plenty of evidence. Perhaps that’s what I found most disturbing about it. This is a book about everything that’s been declassified or leaked. It doesn’t recount those CIA events we DON’T know about, those covert operations and reports still labeled classified and locked away somewhere deep in the vaults at Langley, VA. Of course, much of what the CIA has done over the years will likely never be revealed. There are no documents to declassify simply because these documents no longer exist. They’ve long been destroyed. Time after time the Soviets duped us during the Cold War. Next to the KGB, we looked like a naive group of Girl Scouts. We repeatedly conducted covert paramilitary operations that killed thousands of agents and nationalists working for the agency. Even when the CIA knew the operations were failing and pointless, it continued to send people to their deaths. We’ve given guns and money to rebels who didn’t exist. Bought our way through foreign elections. Financed coups. Sold weapons to terrorist states. Put murderers in power and kept them on the agency payroll. And the list goes on and on. I learned a great deal about the presidents of the country since Truman, and what I learned left me more than a little uneasy. Politics has perhaps tainted the seeking of intelligence more than an other factor. With every administration, the agency seemed to be slipping farther and farther from its charter and deeper and deeper into unconstitutional, unethical behavior. Our current administration is no exception. In the end, I came away with a very negative perception of the agency and wonder if perhaps Weiner had missed some of the successes of the CIA intentionally. Surely we’re not that incompetent? The audiobook is expertly read by Stefan Rudnicki, one of the best readers in audiobooks today, and directed by Emily Janice Card. It’s long, sometimes tiresome, and often depressing, but it is certainly worth the listen or read. It will change how you think about the value and price of human intelligence.